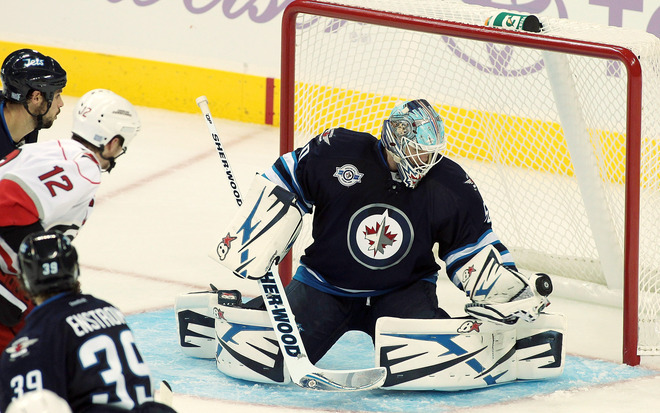 Monday night, the Jets ended their mini two-game home stand with a disappointing 2-1 loss to the New York Rangers. Many thought that maybe the Jets would play catch up again and for a time it seemed that way after they allowed the game's first goal on a power play goal from Ruslan Fedotenko. Nik Antropov, Alexander Burmistrov, and company had another strong game. For once, it seemed the Jets didn't let up on any shift. They weren't coasting on the ice, weren't coughing up the puck in the neutral zone two times a shift, or giving the puck away on cross-ice passes. It was a hard working effort from all four lines and six defense dressed. Even without their top faceoff man Jim Slater in the lineup, the Jets centers managed to win 53% of faceoffs. The Jets outhit and outshot the Rangers, who were playing their final game of a season opening seven game road trip, that included time in Europe. Despite all that hard work, the Jets were not given the benefit of the doubt where penalties were concerned and the five power plays given to New York was the difference in the game. Playing a good game only gets you so far in today's NHL. But kudos to our boys for a good game, nonetheless. As the Jets now embark on a seven game road trip of their own, there's positive vibes that this team may be on it's way to finally getting somewhere. The last two games at home showed us that the Jets are resilient and that they are ready and able to work hard for 60 minutes, no matter the outcome. For that matter, Go Jets Go!